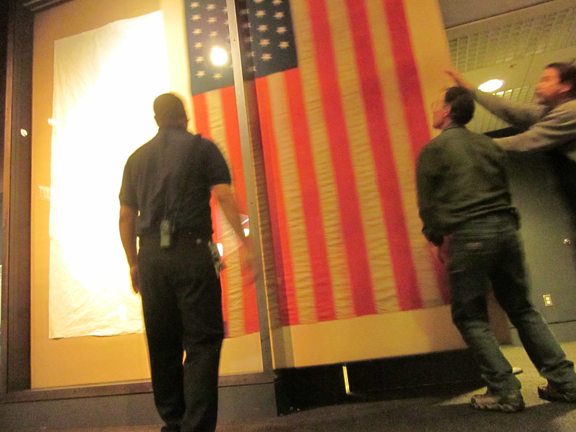 It took some very careful maneuvering to get it into place, but in honor of next year’s New Mexico Centennial, our 47-star flag was moved into its display case today. The fragile flag was secured to 5-by-9-foot board (by rough estimate) that had to be transported down two flights and through the lower-level Collections Storage Area to join our existing statehood exhibit. 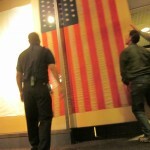 We readily admit that the flag is unofficial, maybe even a tad illegal. 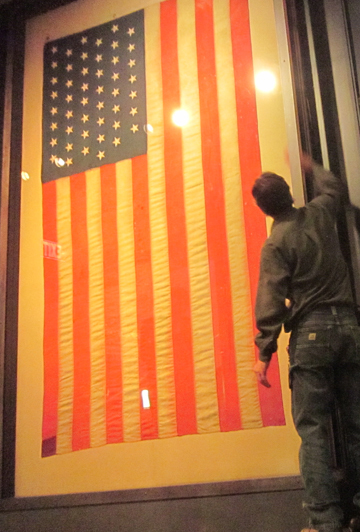 By federal law, new stars could only be added to the U.S. flag once a year: on July 4th. 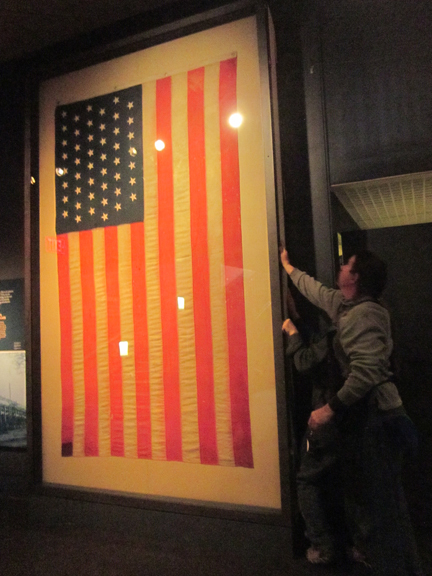 But 39 days after New Mexico’s Jan. 6, 1912 admission, Arizona sneaked in, robbing us of the chance to have a flag with only our additional star. That didn’t stop manufacturers from churning out a few, including the three in our possession. They’ll be rotated through display, a year at a time, to spare them from too much exposure to light. 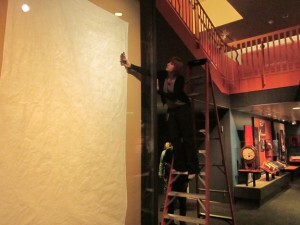 The first one up is the monster-sized version, 65×115¾”. 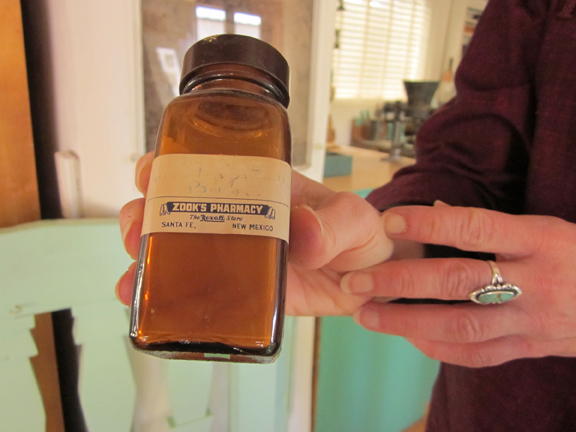 It came to us via a donor in Drexel City, Penn., who said her father had owned it. Getting it into condition to be displayed came courtesy of conservation work done by Rebecca Tinkham Hewett and Cindy Lee Scott. 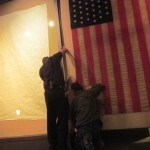 Cindy checks the existing light levels to determine how much adjustment will be needed in their brightness to protect the flag. 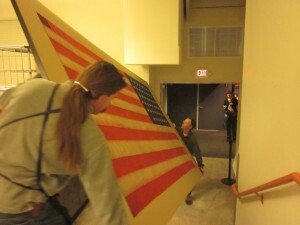 Doug attaches a rail to what will be the top of the exhibition case. At one point, he had to retreat and let Cindy fix part of the edging with that most trusty of any conservator’s tool: A Swiss Army knife. We still have a few Centennial tricks up our sleeve, including a front-window display that will let you pose in a replica 1912 parade float, and a yearlong schedule of statehood-related Brainpower & Brownbags lectures. On Jan. 6, the United States Postal Service will join us for a First-Day-of-Issue event for the official Centennial stamp, designed by New Mexico artist Doug West. It’s all part of what we call 47 Stars, an installation supporting our main exhibition’s section about statehood. 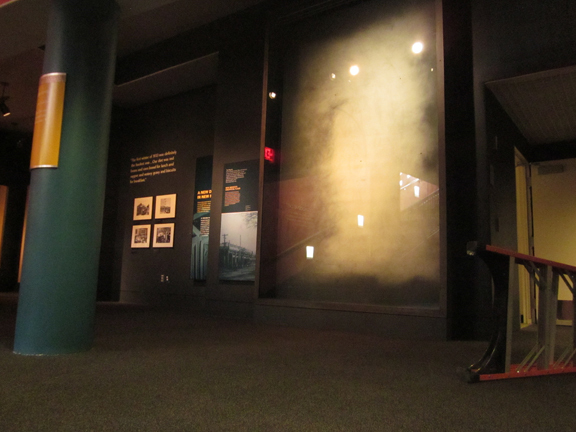 In the meantime, we’re justifiably proud of all the staffers who worked hard to bring this once-depressing (or at least Depressioning) wall in our museum to life. 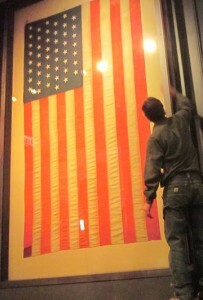 Come by and check it out, along with all the other pieces of the statehood story we have to tell. The First National Bank’s renovation of its building on the Santa Fe Plaza has produced a holiday present for the History Museum. 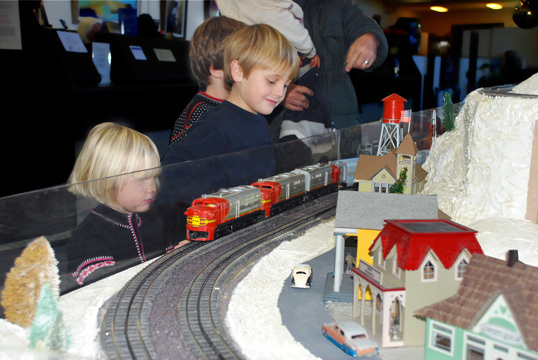 Starting this week, the bank’s cherished model train display has chugged across the street and is on view through December 31 in the History Museum’s main lobby for visitors to enjoy. Come see it for free from 10 am to 5 pm Tuesday through Sunday. Here’s some background on the train: Sometime in the mid-1950s, bank employees Don Van Soelen and Antonio Romero set up a Lionel railroad around a Christmas tree in the bank’s lobby. Another employee, Rollie Abrahams, built an adobe home, church and station still in use today. Since then, the display has grown to include a maroon roof Lackawanna Train Master, a wide-door Lionel Lines Streamliner baggage car, and a set of Santa Fe F3 diesels sporting the famous “Warbonnet” paint scheme. The Albuquerque Society of HO Modular Engineers-Santa Fe Division began helping with upkeep and operation in the 1990s. Volunteers expanded the layout to 8 x 20 feet of four independent 0-gauge loops, and added a Greenleaf Victorian Village on one end and an adobe village on the other, a ski lift and skating rink, and an operating milk-car platform. The bank purchased a special Holiday Train with a musical boxcar and a gondola car where an elf chases a reindeer, and another train modeled on artist/illustrator Chris Van Allsburg’s The Polar Express. 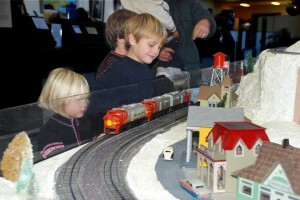 Members of the Santa Fe Model Railroad Club will volunteer to run the trains as often as possible. We’re looking forward to the children and their families certain to come our way over the holidays – and hoping to entice them into staying for our exhibitions. Here’s an idea for those of you living south of Santa Fe: Take the New Mexico Railrunner to the City Different, then come to the History Museum for a full day of indulging your inner Casey Jones. At a ceremony today in Washington, D.C., the History Museum repatriated to the country of Peru an artifact that came from a likely illegal archaeological dig in that country’s Sipan region in the late 1980s. 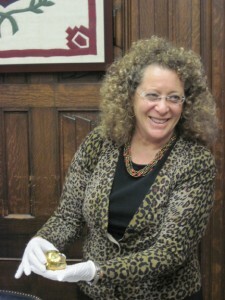 There’s more on that artifact and its history here, but we thought the words spoken by museum Director Frances Levine at the ceremony bore sharing. In situations such as these, the parties can be contentious or they can be diplomatic. We’re proud of Dr. Levine for choosing the latter route. Muchisimas gracias a todos por la oportunidad de estar aquí con ustedes en este día tan historico y importante. As a museum director and an archaeologist by training, I am pleased to be part of this ceremony to return this magnificent Moche treasure to the people of Peru. In New Mexico we understand the process and the importance of repatriation. We too have seen artifacts taken long ago from our ancient archaeological sites and from Pueblo Indian communities returned to the cultures from which they came. And we are grateful for their return. 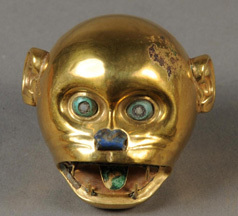 While the Moche monkey head was appreciated by thousands of visitors when it was on display in the Palace of the Governors, I believe it can more fully tell its story when it is placed in the context of the culture and environment where it was created. I believe that this treasure has its own stories and legends to tell to the people of Peru, and that it too will be enjoyed by thousands of your citizens when it returns to Peru. The piece was collected at a time when the world was just becoming aware of the reasons that such contexts matter. Its return symbolizes the commitment of New Mexico’s museums to the recognition of many people’s stories that have told over many centuries. 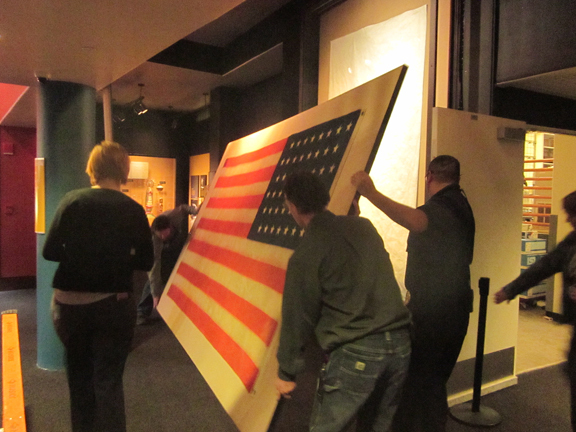 In the last few decades, museums have changed how they regard artifacts such as these. At one time, it was important to bring the world to our visitors, and so we collected from many parts of the world and assembled those artifacts into exhibitions that attempted to tell stories to people who might never travel to these often exotic places. Today, we are choosing to focus on the stories that took place in our own patria, and on our own tierra, and to do so, in part, with artifacts and the oral histories, las memorias, of our own patrimony. Since the New Mexico History Museum opened in 2009, joining the Palace of the Governors, we’ve charted a place for ourselves on the international stage of museums. We worked closely with Spain to host the U.S. premiere of –El Hilo de la Memoria-–The Threads of Memory exhibition in Santa Fe in 2010. We are working now with Mexico on a joint exhibition about santero artistic traditions that united the beliefs and cultures of our two countries. Perhaps, we will also find ourselves working with Peru to examine the colonial conditions of our shared histories, both colonies settled by pobladores who came to the New World from Spain. 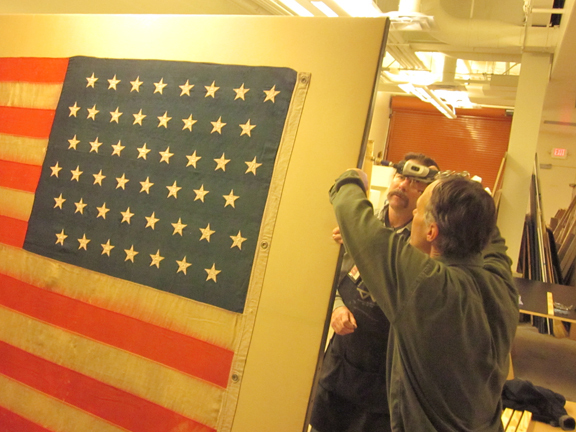 Our museum is proud of its reputation for integrity, cultural sensitivity and cooperation, and with those qualities in mind our museum collections committees and the museums’ Board of Regents voted unanimously to repatriate this precious artifact. As we place this national treasure in your hands, we very much look forward to a future in which we will work toward even more opportunities for collaboration. Esperamos continuar trabjando juntos en el futuro. Gracias. The New Mexico History Museum is preparing to repatriate an archaeological artifact to Peru, a move that signals the museum’s commitment to cultural diplomacy on the international stage. The exchange of the artifact, a gold pendant from the Moché Period (100-800 AD), will take place on Thursday, Dec. 8, in Washington, D.C. Assisting in the return is the Walters Art Museum in Baltimore, where the item has been on long-term loan. “Museums have changed how they regard artifacts from prehistoric peoples,” said Dr. Frances Levine, director of the History Museum. “The New Mexico History Museum and Palace of the Governors has also changed in how it chooses which stories to present and preserve. Our focus today is on the stories that played out on this soil. Artifacts from South America can be better used to help museums in Peru tell the stories of their people. Peruvian officials first raised the question of repatriating the artifact in 1998, when it was included in the exhibition Art of Ancient America at the Palace of the Governors. 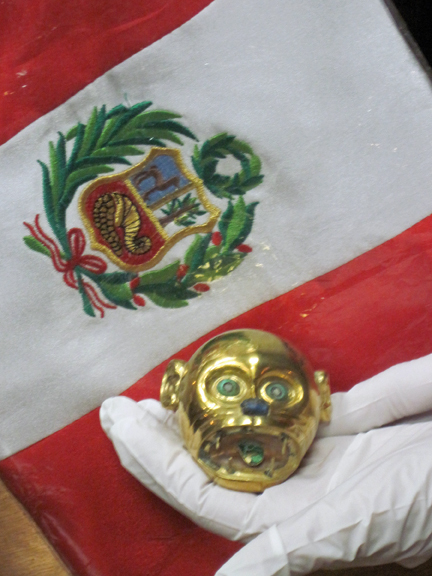 Citing the National Stolen Property Act, the FBI seized the monkey head, along with two artifacts on loan to the museum over allegations that they had been looted from an archaeological site in Sipán region of Peru. 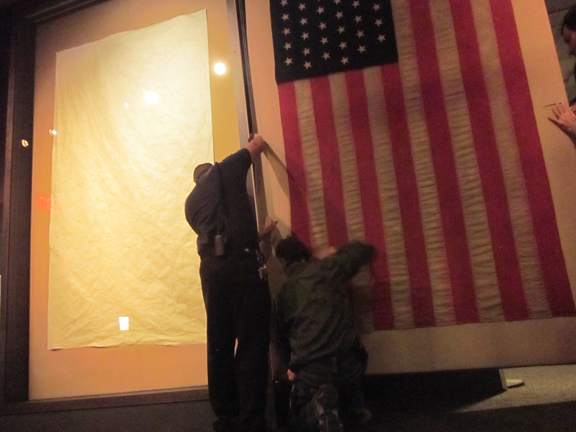 At the time, museum officials said they would return it if evidence proved that was true. Ultimately, the US Attorney’s Office in New Mexico declined to prosecute because of conflicting accounts about the item’s provenance. In 2000, the artifacts were returned to the Palace. Art of Ancient America closed in 2008. Peruvian Ambassador Luis Valdivieso revived the repatriation request in May 2011. 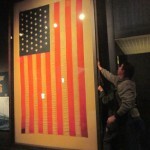 The conflicts over its provenance were resolved by an investigation by the US Attorney’s Office in the District of Delaware, and the History Museum immediately began its process of due diligence. In October, the Museum of New Mexico Board of Regents endorsed a recommendation to return the item. As described in the Art of Ancient America catalog, the artifact is a “large bead finely modeled in the form of a monkey’s head. Turquoise and shell eyes, lapis nose and open mouth with traces of turquoise on (the) tongue.” The pendant measures 1¾” high by 2¼” wide and has a ball tucked inside of it that rattles when moved. The item was given to the Palace of the Governors in 1995 by John Bourne, a Santa Fe collector. At the time of the donation, museum officials cautioned Bourne that it could be subject to repatriation, and they agreed it would be returned if a substantive claim emerged. Artist, printmaker and woodworker Gustave Baumann has a well-deserved “beloved” status in Santa Fe, his home for the final 53 years of his life. The Palace Press at the History Museum re-created his studio, using his original materials, tools and furnishings. The New Mexico Museum of Art owns a number of his prints (some of them on display in an exhibit right now) and the replicas and originals of marionettes he carved for theatrical performances. 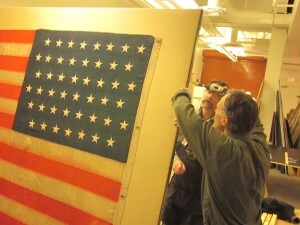 So what’s a conservator from Indiana doing here this week prowling around his legacy? 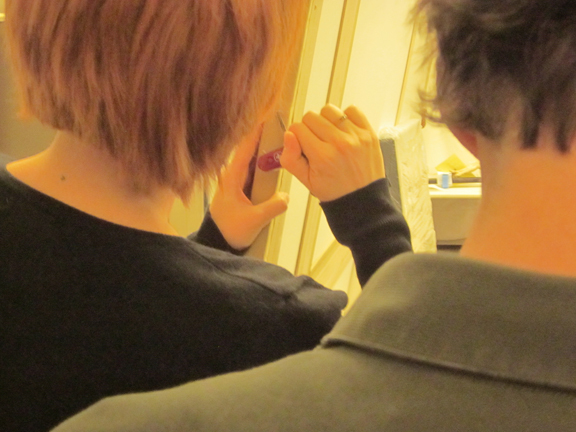 She’s trying to solve a couple of lingering mysteries that Baumann left behind. 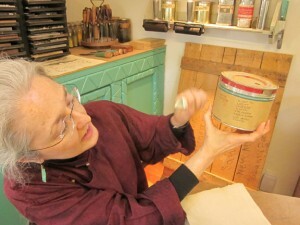 The Indianapolis Museum of Art holds a complete set of prints Baumann made during his youthful stint in that state’s Brown County Art Colony, and Claire Hoevel, senior conservator of paper for the museum, wants to find out exactly what his materials were — pigments, bindings, gessos, the fibers in his papers. 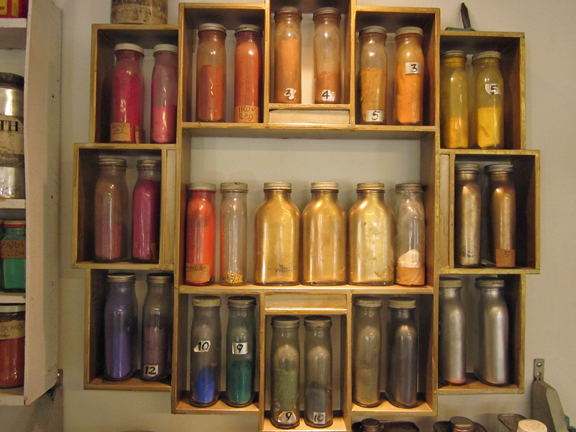 Thanks to the bottles, cans and jars of materials Baumann left after his 1971 death — materials that are now part of the Palace Press’ exhibit — Hoevel has an opportunity rare in conservator circles. 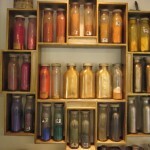 The biggest question she hopes to answer is what Baumann used to bind his pigments. A sec ondary unsolved question lies in what we might as well call The Mystery of the Disappearing Ink. It seems that at one time, one very narrow period of time, Baumann used a particular aqua ink to sign his prints. The signature was visible on the prints when Hoevel’s museum obtained them, but today, it’s gone, vanished, even from prints that were held in dark storage. 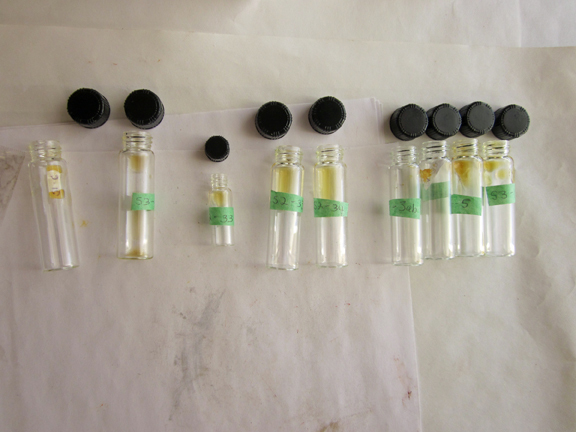 For her samples, Hoevel puts about an eighth of a teaspoon of each powdered pigment into a vial. 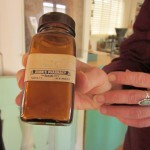 Drops of the varnishes were placed in vials that she left open in hopes of evaporating the liquid to make it easier to transport them back to Indiana. A scientist there will test the pigment samples using microfadometry to determine their light tolerance. With that knowledge, the museum officials will know how long they can exhibit Baumann’s pieces and in what kind of lighting. The results may also affect their loan policy. During her week in Santa Fe, Hoevel’s giving it the full Baumann treatment. She visited the Museum of Art exhibit, The Prints of Gustave Baumann, checked out the Baumann woodblocks held by the History Museum’s Fray Angélico Chávez History Library, and visited the Jane & Gustave Baumann House now owned by the Historic Santa Fe Foundation. Alas, she won’t stay long enough to see the replicas of Baumann’s marionettes perform during the Museum of Art’s Holiday Open House on Dec. 18. According to Hoevel, folks in Indiana consider Baumann’s Brown County stint as “his formative years. We made him what he is,” she said, jokingly. During those years, he “did a great number of extraordinary woodblock prints,” though what items will be displayed pending her investigation’s results has yet to be determined by museum curator Martin Krause. While Hoevel’s work this week in Santa Fe will certainly produce valuable information for Krause, he may be surprised at what other information she brings back. “I’m trying to pressure him into doing a marionette room,” she said with the slightest of smiles.